Editor's Note --- Wally Goodwin coached Stanford for 23 years winning the national championship in 1994. He recruited and coached Tiger Woods, Casey Martin, Notah Begay, head coach Conrad Ray, Joel Kribel among many other stars from Stanford proud golfing tradition. 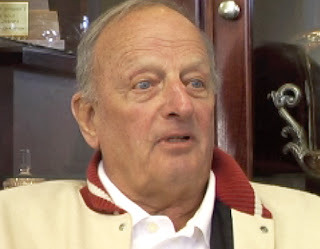 A 5-part video interview of Wally produced by Stanford men's golf can be found at http://www.stanfordmensgolf.org/video-Goodwin.htm. Wally Goodwin’s life has been about new beginnings. The 2010 Wyoming Sports Hall of Fame inductee coached golf and basketball at eight schools during his career, which began in 1960. At every school he went to he was tasked with either building or rebuilding a program. He specialized in wiping the dust off of tarnished championship banners and building programs into national powers. Now, after 47 years of creating and resurrecting, Goodwin has decided to rest. He has left behind the whirlwind lifestyle of a college coach, the constant recruiting and fundraising, and retired to a small house on the former Rafter Y Dude Ranch in Story, a property his family owned since 1921 until his son, Putter, sold it earlier this year. That excitement to see the next place fueled Goodwin throughout his career. After playing on the PGA tour in 1959, Goodwin began coaching basketball at a high school in Colorado. After a stint at a prep school in Ohio and a spell as the athletic director at Robert Louis Stevenson School in California, he became an assistant basketball coach at Stetson University in Florida. His time at Stetson was his first brush with major college athletics. While there, he coached against Larry Bird’s Indiana State teams as well as other major programs like Ohio State and Michigan. He coached at Stetson for three years, but in 1981 he got the call that would shape the rest of his career. The decision to coach golf turned out to be one of the most important of his career. Goodwin’s impact at Northwestern was immediate. After starting from scratch, Goodwin recruited Jim Benepe from Sheridan and made him into an all-American. The future PGA Rookie of the Year was Goodwin's first important recruit, but he certainly wouldn’t be his last. “We started from scratch and had some all-Americans,” Goodwin said. “We had some good teams. It was at Stanford that Goodwin would make his name. He turned a once-proud program that had fallen on hard times into a national powerhouse during his 13-year stint. He recruited the best players in the country to play for the Cardinal, including players that are now household names. He brought in players like Notah Begay, an eventual PGA tour mainstay, Casey Martin, who famously sued the PGA in order to use a golf cart during tour events because his right leg was crippled at birth, and Tiger Woods. Goodwin constructed a diverse unit at Stanford, and he made history. Goodwin was named the national coach of the year in 1992 and 1994. In 1994, the year before Woods came to Stanford, Goodwin led the Cardinal to the NCAA Division I men’s golf championship. His team defeated Texas on their home course to claim Stanford’s first championship since 1953. “That would be the peak of it,” Goodwin said. “It was a thrilling thing to have happen. I was so proud of the guys. This is Texas. We were in their territory. All of their fans were there. In 1995, Woods joined the team. Goodwin had first heard of Tiger when Woods was 13. After seeing him in Sports Illustrated’s Faces in the Crowd feature, Goodwin wrote Woods a letter that planted Stanford in the young man’s head. Years later, when Tiger was a senior in high school, he remembered it. Goodwin recalled having pizza with Woods when the young golfer informed him of his decision to attend Standford. Goodwin said having Woods at Stanford brought an incredible amount of interest to the team. Before Tiger, Stanford golf tournaments were nearly deserted. The team would go on to finish second in 1995 after losing a playoff with Oklahoma State. Woods went on to win the 1996 individual championship before going pro the year after. Despite all of Tiger’s success, Goodwin doesn’t talk about him any differently than he does any of his former players. One of the players he most admired was Martin, who Goodwin defended against PGA legend and Stanford alum Tom Watson, who spoke out against Martin during his trial against the PGA. “Here is a crippled guy that, since birth, has done the maximum he could do with his body,” Goodwin said. “He played on the tour, which was his lifelong dream. I remember going through the trial because that case went clear to the top. I was down in Tucson at the time and the judge in the trial made arrangements to talk to me on the phone. Martin, who is now the head coach at the University of Oregon, said he enjoyed playing for Goodwin, but the relationship between coach and player was the real highlight of playing for Wally at Stanford. “I think relationships are the most important thing,” Martin said. “I think those relationships you forge in golf are going to last. A trophy gets kind of dusty. I think this is probably his life lesson: that relational victories are probably better than victories on the golf course. At his ranch in Story, Goodwin’s office isn’t filled with trophies. He admits winning tournaments was fun, but like Martin, his real treasures are the relationships he formed during his years in golf. According to Goodwin, he wants his legacy to be athletes who followed him into coaching instead of players who became professionals. Goodwin retired from Stanford in 2000. It was his first try at living on his family’s ranch and it didn’t take long for Goodwin to realize he had a few more years left on the course. He served as the head coach for Northern Colorado from 2003 to 2007 before finally settling down to a simpler life in Story. Goodwin maintains that this time, he has found whatever he was missing and that his retirement is final. Martin, on the other hand, isn’t sure Goodwin can handle being 100 percent retired. But Goodwin doesn’t see coaching golf in his horizon. He said that what he wants to go fishing, maybe play a few rounds at the Buffalo Golf Club and watch the Colorado Rockies play at night. This time, he says he is really done. Story by Tom Milstead, tom@buffalobulletin.com.